Satsearch provide a complete end to end range of Fibre to the Home (FTTH) solutions, delivering signals over fibre from the Dish Headend to the customers termination points. Thinking of the future. The Cost effective solution. Network Solution. Affordable Fibre Optic Distribution. Fibre Optic Relocation & Repair Service. Fibre optic cable can be relocated as infrastructure changes take place. We can also offer fibre optic repair service should cables get damaged. In addition to this, we can inspect, clean and test optical cable systems. Fusion Splicer Hire now available from £ 50.00 per day or £200 per week. Senter Smart FTTx Core Alignment Fusion Splicer. Phone for Demo and details. Small, lightweight,, long battery life, 4 motors accurate core alignment 250 times magnification of fibre cores,7s fast splicing, 26s intelligent heating,More than 4000 times electrodes discharging 4400mAh Li-battery, 220 cycles splicing and heating. Ideal for the Service engineer. We now keep in stock a range of LC & LC/APC fibre splitters. See the splitters from the side menu. 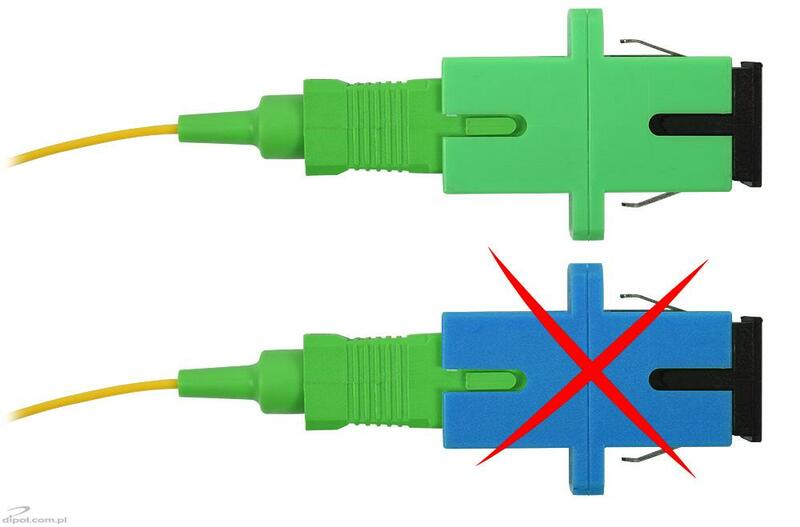 Terminate your own Fibre ends, with this easy to use Quick LC connector, just £3.20 each. PC and APC connectors - are they exchangeable? 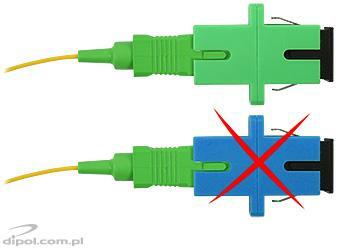 Optical connectors are available in two versions, UPC and APC. UPC means Ultra Physical Contact, APC is the short for Angled Physical Contact. The difference consists in the polishing of the fibre end face. The end face in a UPC connector is flat, in an APC it is polished at an angle of 8 degrees. The fibre end faces polished at that angle prevent reflection of light from the interface between them, ensuring very low back reflection. The selection of the suitable connector is easier thanks to different colours of the UPC and APC versions. risk of damage to the connector - when the angled ferrule touches the flat end face of the (U)PC ferrule there is the risk of scratching the flat face; the problem is particularly important in the case of any connecting/disconnecting operations. New Micos IP Distribution Box. New Product:- High Freq Interlink Coax & dCS Adaptor. Ultra High Freq. ODU32 IRS Interlink Coax. Satsearch market is primarily service and installation for the data, Telecom, CCTV and Satellite Tv industries. As Satellite moves into a new era with fibre optics we have put together some high quality products at completive prices , some of the products you will require to be able to install, service and fault find. Since 1985 we have helped solve the 3 I's (Interconnection, Interface and Installation) of signal management in the Broadcast and Communication industries and have grown consistently to become the engineer's acknowledged service leader across those sectors. We provide a punctual and reliable service and can install and repair any kind of television aerial and Satellite System. Our professional team are committed to providing the highest standards of workmanship. Satsearch is a well-established business with many years of experience in the TV / Video, satellite & data industry. Our company has a great reputation for affordable and reliable services. A lot of our work comes through recommendations and we pride ourselves on our high quality of work. You can contact Satsearch today on 01252 560832 Our services are available all across Surrey, Hampshire and most of the South of England. If you have a problem just give us a ring. ShopFactory shopping cart software powers Satellite & Data by Fibre. All-in one eCommerce software and shopping cart.